Yu-ting was born and grew up in Taipei, Taiwan. She attended National Chengchi University in Taiwan where she obtained her B.S. in Psychology and M.S. in Industrial and Organizational Psychology. She then worked at the Counseling Services of National Chengchi University for two years before she decided to study abroad. She obtained her Ph.D. in Counseling Psychology in Indiana University, Bloomington in 2012. After teaching in the Counseling Psychology program at University of Wisconsin-Platteville for two years, she moved to Seattle with her husband. 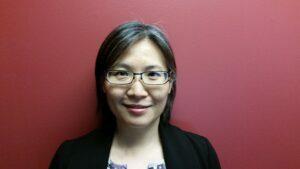 Yu-ting has the experiences of providing counseling services to adolescents, college students, and other populations in Taiwan and in the U.S. She completed her pre-doctoral internship at University of California-Santa Barbara and had worked at the Counseling and Psychological Services and Office of Alternative Screening and Intervention Services of Indiana University while working on her dissertation. She is passionate about helping adolescents and college students dealing with issues related depression, anxiety, substance abuse, cultural adjustment, loss and grief, and other major life transitions. Yu-ting views counseling as a collaborative process where clients and her work together to address her clients’ presenting issues, focusing on clients’ strengths and resources. In her free time, she enjoys outdoor activities, cooking, and traveling. She is very proud that she climbed Mt. Whitney, the highest mountain in the contiguous United States with an elevation of 14,505 feet, in 2004.